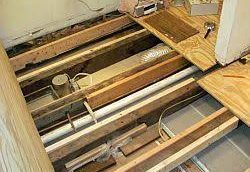 Sagging mobile home floors: are usually a result of water damage in mobile homes with particle board flooring that doesn’t hold up well when it gets wet. 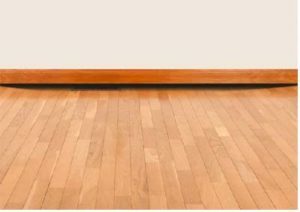 Moisture Barriers Stop moisture from developing directly on the mobile home floor boards and will not allow the floors to rot. Sub floors in older mobile homes are susceptible to this rotting if the vapor barrier breaks down. Vapor barriers in floors also eliminate dangerous mold in your mobile home caused by the moisture build-up in floors. The vapor barrier also acts as an Insect Barrier for your mobile home stopping insect infestation. Subterranean termites are also a problem and are attracted to the wood in mobile homes floor boards. A vapor barrier will not allow the wood in your mobile home floor to become exposed and moist. Sagging Mobile Home Floors or Soft Floors with extensive damage to the Vapor Barrier. Below is an example of a sagging mobile home floors with extensive damage to the Vapor Barrier. The wood flooring and the insulation has eroded due to damage from the Vapor Barrier, which broke and allowed water to enter the mobile home, destroying the Insulation in the floor. This also allows air conditioned and heated air to escape which will cause you to loose money every month on your power bill. Below is a picture of the same mobile home floor that is ready to have new R-19 insulation installed. As seen in this picture, this gives the mobile home owners a complete new flooring system. This will also lower the power bill each month and not allow any varmints or Insects into the Mobile Home. It doesn’t repair well, so when you have sagging and soft floors in your mobile home we replace the old mobile home floor with a good grade of 3/4 plywood. Installation of 3/4 Plywood floors will make your mobile home just like new, because it’s much sturdier than the old mobile home floor and will easily stand up to water leaks and anything else that spills on the new floor. 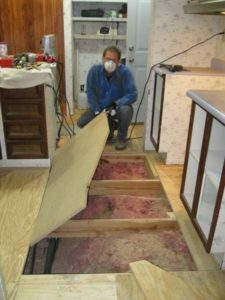 Many times mobile home owners will ask us to simply cut out soft spots in the mobile home floor and replace them with the new plywood instead of redoing the entire floor. This is not the way to go, because it takes as much time to explore the entire mobile home floor and find the soft spots. There will always be spaces that will not be easy to hide if you’re going to cover your mobile home floor with tile or linoleum. As long as there’s no mold or mildew present, we can lay a new plywood floor over the existing floor in your mobile home. You’ll only be inconvenienced once, instead of multiple trips to repair new soft spots and problems as they occur and they will. We will move your furniture out of the rooms we’re going to be working in. If we’re doing the entire mobile home floor we’ll juggle the furniture from room to room carefully. Whatever kind of floor you’re installing in your mobile home, we’ll coordinate with your flooring contractor to make sure we all show up at the same time. If your carpet floor is still in good shape, we can carefully remove it, and your carpet installer can put it back. Once again this will take some coordination. 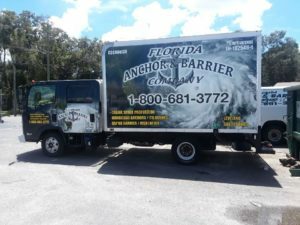 Florida Anchor and barrier can install laminate floors in your mobile home just ask your salesman and he’ll gladly show you some some great samples. The 3/4 inch thick plywood for mobile home floors; is very sturdy and holds up well under all kinds of conditions and we can make sure you’re not left with a bunch of wide seams that are hard to put flooring over and we use threshold risers to transition from one room to another.